Many have called Avengers: Infinity War "the greatest crossover event in history." While that statement has produced plenty a wonderful meme, it takes me back to a time when the true "greatest crossover event" wasn't a movie, but a special one-shot comic book that blew my eight-year-old mind. In 1982, Marvel and DC Comics, the industry's two biggest rivals, teamed up to bring together comicdom's two biggest hits at the time: The Uncanny X-Men and The New Teen Titans. The publishers united their respective teams for a one-shot special, written by the X-Men's Chris Claremont and illustrated by Walter Simonson. At the peak of their success, the Uncanny X-Men/New Teen Titans special set its titular teams against a cosmic menace so huge it took both groups to take them down: the union of Darkseid and Dark Phoenix. This comic was a true event, and came out years before either Marvel or DC produced Secret Wars or Crisis on Infinite Earths. It only happened once, making it seem even more special today. It's been 36 years since it came out, but the ripples of this single issue are still be felt. Here are five ways that Uncanny X-Men/New Teen Titans special is still important, and still and awesome read, even today. Even after 38 years, the X-Men's "Dark Phoenix Saga" is still seen as THE seminal X-Men tale. The story depicted the slow mental degradation of X-Man Jean Grey, now the cosmic entity known as the Phoenix, into the malevolent Dark Phoenix. Completely going against comic book norms at the time, Jean died at the end, sacrificing herself for the good of the universe. This storyline is so beloved it's been adapted for film not once, but twice. 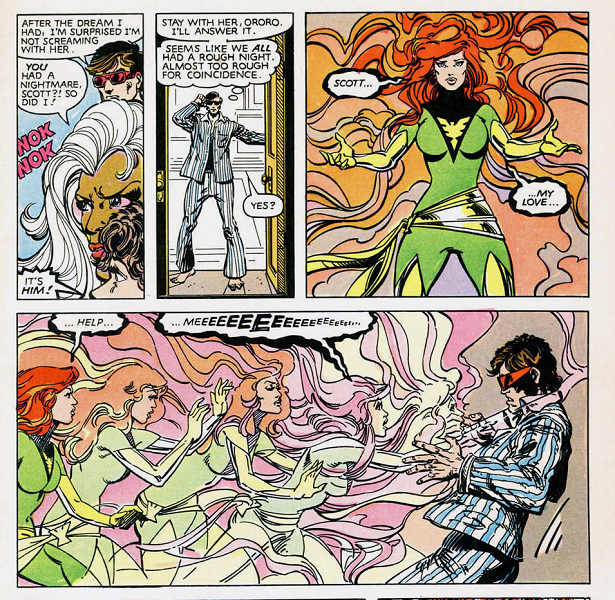 Although Jean would eventually come back, the Dark Phoenix aspect of her would never truly return, except for brief hints and teases here and there. However, the only time Dark Phoenix returned as a true threat to the universe was in this crossover, where she was resurrected by Darkseid himself. True, this story is technically out of continuity with the main Marvel titles, but it's still Dark Phoenix unleashing holy hell on her teammates, and written by the man who created her, Chris Claremont. Worth the cover price alone. Both the X-Men and the Titans have had several roster changes over the years, but this comic came out at the peak of popularity of both series, and it showcased what is considered to be both team's best line-ups. Aside from Rogue (who had yet to join the team) and a handful of other X-Men, the roster here continues to be the X-Men's most beloved by fans. As for the Titans, they have never had a better team line-up than the one depicted here. Decades later, it was the basis for the now classic animated show, and soon, the upcoming live-action series. If you want an epic tale with the best versions of both super groups, this is still the story to read. At the time of the special's publication, the character of Darkseid had only existed for about twelve years or so at DC Comics, and his appearances were limited to Jack Kirby's New Gods titles, as well as a handful of appearances in series like Justice League of America. But when Claremont and Simonson made him the "Big Bad" of the crossover special, it solidified Darkseid is the #1 threat in the DC Universe. Not long after, Darkseid began making his presence known in DC titles like Legion of Super-Heroes and others. While Darkseid's creator Jack Kirby drew a formidable version of him, I'd argue Walter Simonson made him even more terrifying here, and set the template for how he was portrayed for decades to come. When Jack Kirby created the mythology of the New Gods for DC, one of its founding principles was the idea of "The Source, " the energy and consciousness of the universe. In his original stories, he referred to a barrier at the end of the universe where the Source ends. Kirby never visualized this, but Claremont and Simonson did for this crossover special, being the first comic to ever show readers what the legendary Source Wall looked like. Today, the Source Wall is a staple of DC mythos, currently playing a huge part in the Justice League: No Justice mini-series. At the time that this issue hit, the character of Deathstroke had only made a handful of appearances in the pages of The New Teen Titans. But writer Chris Claremont knew a good character when he saw one, and utilized mercenary Slade Wilson in several tremendous action scenes throughout the issue, showcasing what a badass character he was. (He takes out X-Men powerhouse Colossus like he was a rag doll!) That Deathstroke's popularity took off big time after this comic hit the stands is certainly not a coincidence. Does this make you more interested in reading this hard to find story? Let us know your thoughts down below in the comments.